He has been dancing since 2005 and spinning poi since 2010, continuously exploring the fusion of flow circles and dance lines. Early 2013, he discovered the magical art of levitation wand. He has since been exploring a flowful style of spinning the wand which enables a freer expression with the body thru dance and performance. Ehrlich “Firechill” Ocampo is the leading innovator and forerunner of the art of the levitation wand in the performance and entertainment arena. 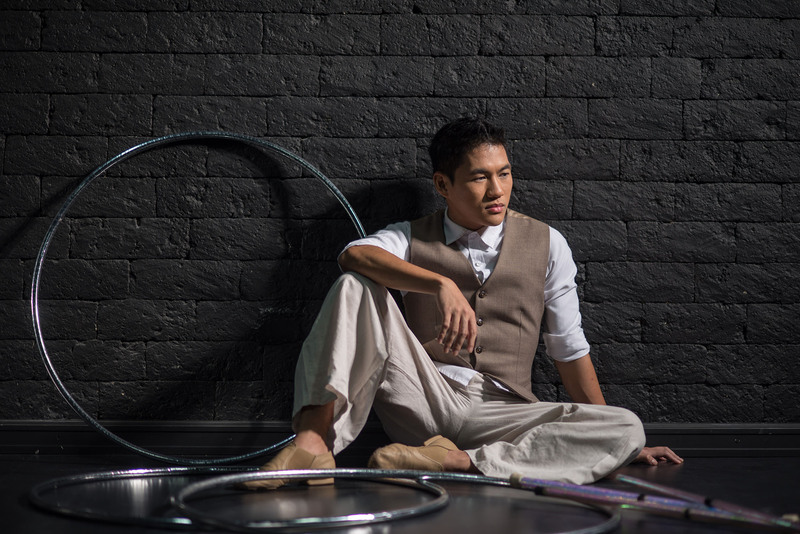 He has also been training hoop dance and manipulation, hand balancing, aerial hoops and the cyr wheel. Ehrlich “Firechill” Ocampo has travelled and been invited to numerous events in Singapore, South Korea, Malaysia, Thailand, USA and France – where he recently represented his art and his country in the 37th Festival Mondial du Cirque de Demain in Paris. He is also included in Cirque du Soleil’s database of talent as a Fire Performer and Levitation Wand Dancer. Around 2017-2018, he has been performing for Okada Manila’s World of Wonders by Creative Director Giulio Scatola, formerly of Cirque du Soleil, and eventually under Livia Pacagnella-Dos Santos. In 2019, he is set to perform for Cirque du Soleil at Sea aboard MSC Bellissima. Aside from performing, he has also been conducting movement workshops as well as choreography and performance workshops to enable more artists to explore a wider range of movements and allow his/her style to manifest more with the body, allowing the artist to translate his/her flow into a performance. He is also a performance artist, creating pieces that speak deeply to the human soul rather than to merely entertain. He spearheaded Flow Collective, the Philippine’s Modern Movement and Circus Arts Community, and founded LeviwandDance.com, the ultimate channel for those who want to dance with magic using the leviwand.